SKD process is launched by Adampol S.A. in Logistics Centre in Malaszewicze again. - Adampol S.A.
2018 was fruitful for Adampol S.A. in terms of SKD (Semi Knock Down) projects. The SKD process was resumed in November 2018 at the Logistics Centre in Malaszewicze. 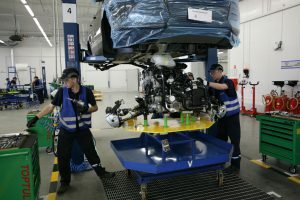 This time the process involves the dismantling of cars of several major European Automobile Companies. In 2018 we finalized several such projects, while this year is expected to be followed by the implementation of further long-term projects of this type, which are a consequence of the successes of 2018. We ended the previous year with several SKD projects behind us. This year Adampol S.A. is going to continue with these types of activity as an extension of the achievements of 2018. 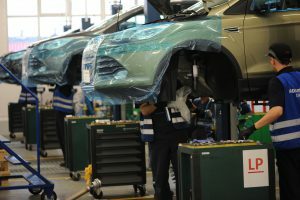 80 of the company’s employees are involved in the process of dismantling cars. Adampol S.A. has been delivering SKD services at the Logistics Centre in Malaszewicze since 2012. 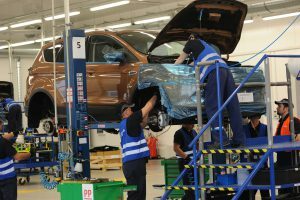 The process involves the disassembly of ready vehicles into parts and subassemblies, packaging them in an appropriate manner and sending them to the country where they are to be assembled. That is where the assembly of ready subassemblies takes place using a technology that is comparable to that of the original production plant. All processes are carried out according to rigorous standards and quality criteria applied and required by our Customers.